Osa’s First Junior Christmas Bird Count – Results Are In! 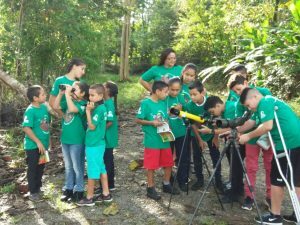 We are excited to present the results of the “First Junior Christmas Bird Count, Península de Osa 2017” in conjunction with the Natural Resources Foundation of Wisconsin, Fundación Neotrópica and 16 educational centers in the Osa. During this special day, participants saw a total of 93 different species and 595 individual birds! Throughout the event, school children learned about the importance of local and migratory birds and their habitat, helping to create the next generation of guardians for Osa’s natural heritage. The logo of the event consisted of a Golden-winged Warbler (Vermivora chrysoptera), which was selected due to its status as a wintering migratory bird in the Osa from Canada/United States and its threatened status, classified by the Red List IUCN due to the loss of its habitat from agricultural expansion. 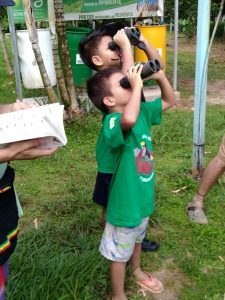 This First Christmas Junior Bird Count in the Osa was carried out on December 5 – 7, 2017 with the participation of 165 children from local schools. 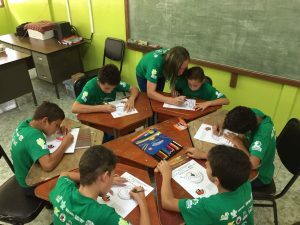 In each of the 16 schools, children learned from a naturalist guide about why birds are important indicators of global health and they learned about the migratory Golden-winged Warbler as they colored the logo in creative ways. Students then went out with the naturalist to walk around the school property looking for birds and registering all of the birds that they were able to see. Students learned how to properly use a scope and binoculars, to identify different bird species, and to record data from their sightings. With the success of this First Christmas Bird Count, children were able to experience the beauty of nature while supporting research to monitor the health and long-term condition of bird populations worldwide. Many thanks to the support of the following institutions and organizations: Golfito Campus, UCR, Ficus Tours, Osa Birds: Research and Conservation, Osa Wild, Osa Dreamcatcher Tours, Utopia Drake Outdoors, Osa Birders Tours, Lapa Rios Ecolodge, Danta Corcovado Lodge, and the La Palma Academic College. Thank you very much for your collaboration!